The two temples of Abu Simbel - the Temple of Ramses II and the Temple of Hathor (the Sun God), dedicated to his wife Nefertari - were cut out of the sandstone cliffs more than 3,000 years ago. Not only are these ancient temples among the most magnificent in the world, but their removal and reconstruction are recorded as an impressive engineering feat. The temples were relocated, very successfully, during the construction of the High Dam on Lake Nasser in the 1960s. The monuments were threatened with submersion, and after an appeal by UNESCO, in co-operation with the Egyptian Government, they were dismantled and reassembled exactly as before, about 197 feet (60m) higher up. The intimidating sight that first greets the visitor at Abu Simbel is that of the four colossal statues guarding the entrance to the Grand Hall of the Temple of Ramses. The interior is highly decorated with relief paintings and is supported by eight statues of Ramses acting as giant pillars. Leading off the hall are painted sanctuaries and chambers. The Temple of Hathor is smaller and simpler, also with statues guarding the entrance and a manifestation of the Sun God portrayed above. It is aligned in such a way that the sun's rays reach inside to illuminate the statues of Amun-Re, Ramses II, and Re-Horakhty twice a year. The statue of Ptah, a god of the underworld, remains in shadow. 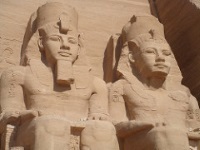 The temples are considered to be the grandest and most spectacular monuments built during the reign of Ramses II.